Today's post will look at a field of collecting that has been very neglected, and which I believe offers philatelists an unprecedented opportunity. That field is the collecting of modern postal history. Modern postal history for the purposes of this post is all the postal history for stamps issued during the present reign of Queen Elizabeth II. 1. Frequent postage rate increases. 2. The proliferation of commemorative se-tenant issues and souvenir sheets, many of which were never intended to be used for postage. The rate of the cover is the amount of fees that were required to pay for postage and any other services that were purchased in connection with the delivery, such as special delivery, acknowledgement of receipt or registration. Some rates, like local first class are very common and add nothing to the cover in terms of its desirability, while others such as registered special delivery to a foreign destination are scarce and make a cover collectible in its own right. The route and destination refers to how and where the cover traveled. Prior to membership in the UPU (i.e. before the 1890's) many different routes were followed to deliver mail, each one having a different rate. However by the 1950's the routes were standard, so they do not differentiate covers in terms of scarcity. However, the ultimate destinations are very important. 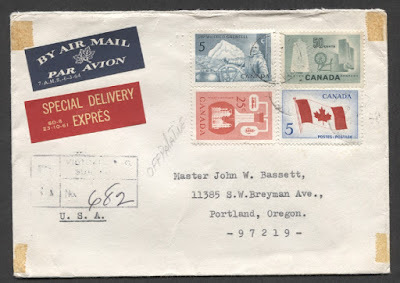 A cover addressed to the US, or Great Britain is nothing to get excited about, as that is where the majority of foreign mail sent from Canada would be going. However, a cover to some exotic locale like Ivory Coast, Greenland or Papua New Guinea would be desirable no matter when it was mailed. 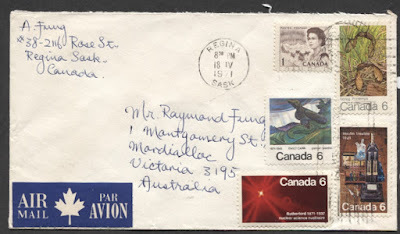 Finally the franking refers to the combination of stamps used to make up the rate. Generally speaking, most covers would have been franked with the fewest number of commonly available stamps to pay the required rate. So in other words, definitives would be the usual stamps employed. So in assessing the scarcity of a rate, you look at how common the stamps used to make up the rate are. All other things being equal, the large the number of different stamps used, the better, and the scarcer each stamp is the better the cover is. Another important factor is that the stamps used on the cover be used within the proper period. What does this mean? Well for definitives, the period of use generally ends when the next equivalent stamp is released to replace the present stamp issue. For commemoratives the definition of the period is a bit less definite, since they come out nearly every month, but generally speaking within about 12 months or so is acceptable before they are considered to be late, out-of-period usage. Lets take a look at four modern covers, all of which are scarce and desirable and apply the above factors to look at precisely why they are so much better than ordinary covers. Then in the rest of the post, I will look at each major period of the modern era and will identify the opportunities that exist in each are to find and collect better covers. 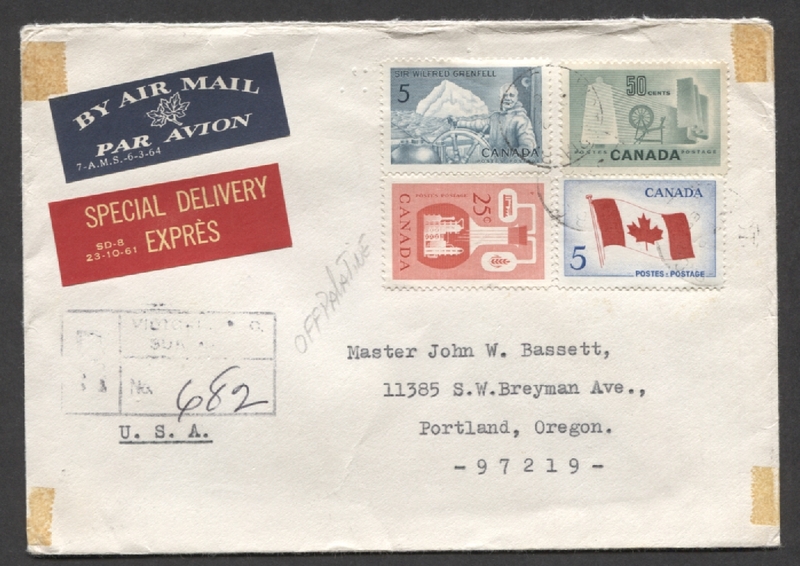 This first cover is a registered special delivery cover sent to Portland Oregon in 1965. So right away, the rate is a scarce rate, since most covers would either have been registered, or special delivery, but not both. The rate for a registered special delivery cover to the US would normally be 35 cents if the indemnity were limited to the basic rate of $50. The destination is to the US, which is common, so there is no real increase to the desirability of this cover on the basis of destination. However, if this cover were addressed instead to another country like Australia, or Fiji, then it would be a much more expensive item. The rate of 85c indicates that 55c represented postage, which is 11 times the normal rate for an ounce. This must have meant that the envelope weighed 11 ounces. A look at the customs label on the back reveals that it contained a complete set of coins to the silver dollar, which would have been about right. So the rate is desirable because of how unusual it is. 4 x 20c paper industry definitives + 5c Cameo definitives. a single 20c Quebec Ferry Centennial definitive plus a 5c Centennial. However, this cover has been paid using no less than four different commemorative issues from 1971 plus a 1c Centennial definitive to make up the rate. Not only are all the commemoratives different, they represent ALL four of the issues that had been released between January 1 and April 18, 1971. In other words, the franking could not possibly be any better for this rate. If instead of four different commemorative issues, there was only 2 different issues in pairs, then this would be a much less spectacular cover. a single 50c Seashore definitive, a 25c Polar Bears and a 10c Forest definitive. However, instead of the commonly available 25c Polar Bear definitives that were available at the time, three examples of the 25c Silver Jubilee commemorative for Queen Elizabeth II were used instead. The only way this franking could be improved is if instead of three copies of this stamp, there were one copy and then five 10c commemoratives from this period. 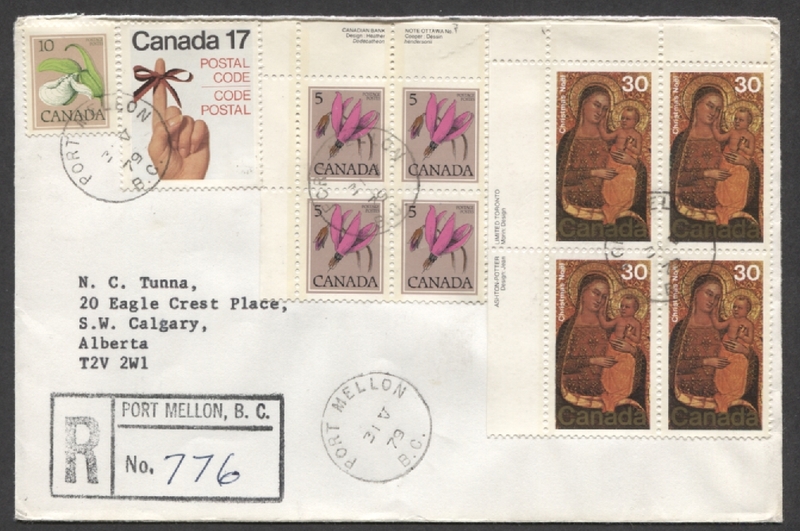 This $1.67 local registered cover had been sent in May 1979, when the rate for registration had increased to $1.50. It is important to note that because rates for registration increased almost yearly at this point, that any registered cover is now a more desirable cover because the particular rate will always be scarcer than the same registered rate from a period like 1972-1976 when it did not change. three 50c seashore stamps plus a 17c parliament of 17c Queen Elizabeth II definitive. On this cover, the only definitive present is the 10c Lady's Slipper stamp and a plate block of the 5c Shooting Star from the floral issue. The remaining $1.37 has been paid entirely with commemoratives, including a plate block of the high value 1978 Christmas Issue and the 17c postal code issue. Given the size of the stamps, it is a difficult franking to improve upon. What makes it even better though is that there are two plate blocks. You almost never see plate blocks on anything other than official First Day Covers. Most people would have torn the selvage off in order to make sure that the stamps would fit on the envelope. The 1978 Christmas issue was released on October 20, 1978, so while May 1979 is a bit late, it is still not out of period. This period represents the period of greatest stability in rates, spanning nearly 15 years. There were really no souvenir sheets yet, but there were booklet panes and cello-paqs. So the thing to look for during this period is really the higher airmail and registered rates paid using combinations of commemoratives, booklet panes or complete cello-paqs, as well as better destinations for the standard rates. This period is when we begin to regularly see se-tenant stamps. Prior to this the 1957 Sports issue was the only se-tenant issue. The thing to look for is complete se-tenant combinations of the 1970 Expo issue or the 1970 Christmas Issue and the 1968 & 1969 Christmas booklet panes used to pay the higher registered rates. This very short 6 month period has only 3 commemorative stamps, plus the 1971 Christmas issue that were released during the period. So pretty much any registered cover or foreign airmail cover paid with a combination of these stamps instead of Centennial definitives will be more desirable. This period was one of the longest in terms of no rate changes. As a result, most of the lower rates are not that scarce, nor are the basic registered rates by themselves. There are A LOT of se-tenant issues that were released during this period, and because the basic rate was 8c, the oversize rate was 14c, and the double foreign airmail rate was 30c and not 32c, it will be hard to find se-tenant pairs and blocks of 4 of the commemorative issues of this period on cover. These are the issues to look for as well as the higher registered rates paid using the $1 and $2 commemorative olympic stamps rather than the $1 and $2 definitives from the Caricature issue. The bulk of the semi-postal stamps issued for the 1976 Montreal Olympics were issued during this period. They were not popular of course because of the premium that they were issued at, so finding them on cover is very challenging. This especially the case for the 20c stamp, which would only have been found on an overweight US letter. This is another short rate period. only 2 commemorative issues, plus the 1976 Christmas issue were released during this period. All the rates of this period are scarce and desirable if paid with primarily commemoratives. During this period we have a good number of se-tenants, all of which are either pairs or blocks of 12c stamps as well as a 25c commemorative. None of the basic rates are multiples of 12c, so any se-tenant will be scarce on cover. Also, there is no basic 25c, 50c or 75c rate, so the 25c parliament commemorative will also be scarce when used in this period. Here the basic se-tenant stamps are 14c denominations and this is the period that we regularly begin to see higher value 30c commemoratives to pay the foreign airmail rates. Despite being issued for this purpose, they are still somewhat scarce on foreign airmail covers. The comments made above about the scarcity of se-tenants above applies here also, as none of the higher rates are divisible by 14c. The first souvenir sheet, the 1978 CAPEX sheet is issued during this period. However, the face value of $1.69 does not correspond to any of the basic registered rates that were in effect, so it will be hard to find used on cover during this period. This is the shortest rate period of the modern era: only 3 months! What is notable about this period is that it is the last period where imperial weights were used and the first miniature sheet of 12 commemorative stamps appears. The only rates that would change in the next period would be the oversize domestic and USA rates, so getting covers from this three month period with those 27c (local) and 31c (USA) rates is a challenge. Once again, there are no rates that are multiples of 17c, so the se-tenants are hard to find on cover. This period has a large range of 17c se-tenant commemoratives and several 35c higher values intended for the international airmail rates. Many of the same comments about the scarcity of the se-tenant combinations applies here as well as the desirability of the 35c values used for the higher registered rates rather than foreign airmail. This period represents the largest single rate increase for domestic rates to this point, with the rate almost doubling from 17c to 30c. The rates increase almost yearly from this point on, and the third class rate is eliminated in this period. The foreign rate is exactly double the domestic rate for the first time and this will continue in the other periods. What this means is that se-tenant pairs, while scarce on cover, are not as scarce as before since they can be found on foreign airmail covers. Before, they would only be found on higher rate registered covers used in combination with other stamps. This period saw the domestic rate increase to 32c from 30c on February 15, so 30c covers from January 15-February 14, will be scarce. The first commemorative booklet of se-tenant stamps, the 1983 forts booklet appears in this period, as does the $2 Commonwealth Day commemorative. The comment above about the scarcity of se-tenants applies to this period as well. Here the domestic rate was 34c and the foreign rate 68c. The comments about se-tenants are the same here as above. This is another short rate period, lasting only 9 months. The non-standard 42c rate disappears after this brief period and only 1 stamp, the 42c bobsleigh was issued for this purpose. So properly used examples on cover should be scarce. Despite the short length of this period, over 20 stamps were issued and properly used on cover in this period should be quite scarce for any rate. There are no se-tenant pairs issued during this period, only blocks of 4. However, none of the basic rates were $1.48, so blocks properly used are scarce. The popular 50c Art Canada stamps make their first appearance in this period as well. Again, they are scarce on cover, as there were no 50c rates during this period. There are some issues during this period in se-tenant pairs, so it is possible to find these used to pay the international rate, though they are not common. The first prestige booklet, the 1990 Canada post issue appears, and complete panes could conceivably have been used to pay the higher registered rates. The scarce Petro-Canada panes of 4 of the boreal forests issue appear as well and would be very scarce on cover. The issuance of commemoratives exclusively in booklet form starts in earnest during this period and we begin to see sets of 4 or 5 stamps in se-tenant form available only on booklet panes of 10. Complete panes or strips from the panes could have been used to pay the higher registered rates. There are once again no issues that came out only in se-tenant pairs, so any se-tenant would have been used only in conjunction with other stamps to pay higher rates. Canada's second true souvenir sheet, the basketball sheet with $1.66 face value is issued. This potentially could be found used on a registered letter. In this period, the majority of the commemorative issues are in se-tenant booklet form, with panes of 10. The first $5.04 Canada Day pane is issued, which, because of its huge size could only ever be found on a large parcel fragment. The Canada 92 souvenir sheets appear, with a face value of $2.16 and could be found on registered mail. The Canada in Space issue and Roland Michener issues are both issued in se-tenant pairs and can be found used to pay the international rates. This period saw the domestic oversize and overweight rates, as well as the USA and international rates increase on March 1, 1994. That is significant because the basic stamp value stayed at 43c, while the international and oversize rates became 88c and not 86c. This meant that as of March 1, 1994 a pair of stamps would NOT cover the domestic oversize of foreign rates, as would have been the case prior to this date. The majority of stamps now are either from booklets or souvenir sheets. The Art Canada stamps now have denominations that correspond to the international rate, so that single usages of these on foreign mail are now possible, but by no means common. Only 1 single issue: the 1994 Great Canadians Billy Bishop and Mary Travers was released in se-tenant pairs and these can be found used to pay either the domestic oversize of foreign rates. There are several sheets now such as the Canada Day sheet and automobile sheets that are so large, that the only letters they will likely be found on are large oversize envelopes. This is a fairly long period of rate stability that comes a period of very frequent rate increases. The Chinese Lunar New Year stamps begin to appear in this period, with the 90c Year of the Ox souvenir sheet being of a face value (90c) that could actually be used on a foreign letter. Most of the stamps are from booklets or souvenir sheets, although quite a few single stamps and se-tenant pairs were also issued during this period as well. Canada's largest souvenir pane, the $3.05 historic land vehicles pane containing 25 stamps was issued during this period. This was the first commemorative issue to feature face values smaller than the first class rate, which was 45 cents. In fact, this pane included 5c, 10c and 20c stamps. So multiples of these stamps could be found used to pay the standard 45c rate, which would be scarce. Semi-postal stamps, which had not been issued since 1976, reappear in this period, with the 45c literacy stamp. Again, this is not a common stamp to find on cover. For the first time in many years, the domestic oversize rate is 3c cheaper than the international rate, being 92c versus the 95c international rate. The basic face values are 46c, so that once again, a pair of 46c stamps is NOT enough to cover the international rate. Quite a few single stamp issues came out and only a few pairs. The most interesting items to appear in my opinion are the Millennium souvenir sheets that consisted of four 46c stamps. To be properly used, these would have to have been either on a registered or overweight international letter. During this period the spread between the domestic oversize and international rates grows by 11c, with the domestic oversize rate continuing to be double the normal first class rate. Except for the Christmas issue, only one other issue comes in 60c denominations for the US rate, so that most issues would require make-up definitives if used to pay the US rate. Thus it will be uncommon to find the basic 47c commemoratives used to pay either the domestic overweight, US first class or international rates. The number of stamps issued in sheet and booklet form seems to be about equal. The domestic rate increased to 48c, but the first 48c stamps were issued on January 2, January 3 and January 12, so it is possible to find these used before January 14 to pay the 47c rate before the actual rate increase to 48c had taken effect. The spread between the domestic oversize and international rate grows to 29c now, with the rates being 96c and $1.25 respectively. Again, there is a fairly good mix of sheet and booklet stamps, but the vast majority of commemoratives are 48c denominations, which will seldom be used for anything other than local first class mail so finding these on higher rate covers in combination with other stamps is desirable. The spread between the domestic oversize and international rates is now 42c, with the rates being 98c and $1.40 respectively. There is a good mix of souvenir sheets, sheet singles and booklets, as well as quite a few se-tenant pairs, which can be found used to pay the domestic oversize rate. However, there are very few commemorative stamps in this period that are suitable for the international or US rates, so finding international letters or US letters with commemorative stamps will be unusual and desirable. For the first time in many years, all the standard rates are whole numbers divisible by 5. Almost allof the commemoratives are 50c denominations, so they will generally not be found on either US letters or international letters. There is a good mix of se-tenant pairs, singles and se-tenant blocks of 4 during this period. The blocks of 4 will be very scarce on cover as they would only be found on either overweight international letters or registered letters. For the first time, the domestic oversize rate is more than double the first class rate, which is now 51c. So the 51c stamps now are really only good for use on local letters unless make up definitives are used. Again, most of the stamps are 51c stamps, so finding sets or se-tenants on cover is very difficult. The domestic rate increases to 52c. Once again the vast majority of the commemoratives are 52c stamps, so finding either US, domestic oversize, domestic overweight, or international letters used with commemorative stamps is challenging. The domestic rate remained at 52c. The domestic overweight and US rates both went up by 3c and the oversize and international rates both increased by 5c. The first permanent, non-denominational commemorative stamps appear in this period. Nearly all the other stamps are 52c stamps, so again finding these on anything but local mail is a challenge. Semi-postal stamps for mental health appear in October 2008. They are permanent non-denominational stamps sold at a premium of 10c over face value. Again, they are not common on cover. The domestic rate goes up to 54c, the US rate is now 98c and international is now $1.65. The $3 Hockey Lenticular stamps are issued during this period in souvenir sheets of 3. These could exist used on registered letters, as the registration rate by now is more than $9, Most of the commemorative stamps continue to be 54c denominations, which would be scarce used on anything other than local covers. The mental health semi-postal series continues in this period. The domestic rate increases to 57c, US increases to $1 and international increases to $1.70. The domestic overweight and oversize rates all increase as well. Again, like in the prior periods, there are very few $1.70 stamps, no $1 stamps and a large number of 57c stamps, so that finding anything other than a local first class letter with commemorative issues is a challenge. The domestic rate increased to 59c, while the US rate jumped to $1.03 and the international rate went to $1.75. Nearly all of the commemorative stamps issued during this period are non-denominational, permanent stamps. The last mental health semi-postals are issued during this period. The domestic rate increased to 61c, while US went to $1.05 and international to $1.80. The $2 Diamond Jubilee stamp appears during this period, and would generally only be found used on either overweight international mail or registered mail. Personalized stamps become popular during this period. There are more $1.05 and $1.80 commemorative stamps than before, but still the vast majority of commemoratives are non-denominational permanent stamps, which will generally only be found on local first class letters. A new series of semi-postals for the Canada Post Community foundation is first issued. Again, these are permanent, non-denominational stamps sold for 10c over face value. Like all the other semi-postals, they are scarce on cover. The first computer vended postage stamps are issued during this period on an experimental basis. They are all very rare. The local domestic rate increased to 63c, with US going to $1.10 and international to $1.85. The domestic oversize and overweight rates increased as well. Denominated 63c commemorative stamps re-appear in addition to the permanent non-denominational stamps. There are very few $1.10 and $1.85 commemorative stamps during this period, so that again, most commemorative issues would only be found on local mail. The Canada Post Community semi-postal issued continue to be issued in this period. The second issue of computer vended stamps appears during this period. The trial period ended in July 2013 and the issue was not continued, so copies used on cover within the 6 month period during which these stamps were issued are very scarce. The local domestic rate increased by the largest amount in history, 22c going to 85c. The US rate increased 10c and the international rate increased by 65c to $2.50. The $5 cloth flag stamp was issued on February 15, 2015 and this can certainly be found on registered letters. There are a good number of $1.20 and $2.50 commemorative stamps issued during this period. All the 85c stamps are non-denominational. The Canada Post Community semi-postal issued continue to be issued in this period. This concludes my overview discussion of the collecting of modern post 1952 postal history for Canada. Hopefully you can see from this post that there are a lot of opportunities for the ambitious philatelist, and a lot of challenge. In fact, I would wager that it will prove to be next to impossible to complete a collection of all post 1952 stamps properly used in-period on cover including all the se-tenant combinations. So it is a fantastic area for a collector on a limited budget, who possesses the discipline to seek out only correct, in period usages of the modern stamps. You've shared postal covers that are really wonderful. And you have provided information about the postal cover that is very important. While in general I would agree with your conclusions, I am a little concerned that the choice of stamps has some philatelic influence, and here in the UK it might "mark-down" one of the covers a little, but not too significantly. Would a small town or village postmark enhance the value or not ?